Note: in British English, flax refers generally to the fibre crop while linseed refers to the oil crop. In American English, the two words are more interchangeable (Muir et al., 2003). Flax (Linum usitatissimum L.) is grown for its oil or its fibre, depending on the variety. Flax is a summer annual erect plant, 20 to 150 cm high, with a tap root. The height and the branching habit depend on the end-use of the plant. Large-seeded genotypes intended for oil production are many branched and shorter than typical fibre flax. Flax leaves are alternate, linear to linear-lanceolate, 15-55 mm long x 3-13 mm broad, and drop as the plant matures. The flowers are apically borne in panicle-like inflorescences. The fruits are round, dry capsules, of 5-9 mm in diameter, which contain 10 seeds in large-seeded oil varieties and less in fibre varieties. Linseeds are ovoid, 3.3-5 mm long. The weight of 1000 seeds ranges from 4 to 13 g. The seeds are yellow, dark brown or olive coloured (Muir et al., 2003). Flax straw (or linseed straw) is the vegetative part of the plant left in the field after harvesting of linseeds for oil production. Flax chaff (or flax boll chaff) results from the winnowing of flax for linseed cleaning. Flax shives are the non-fibrous part of the stems (not including the seeds) remaining after extraction of the bast fibre (the fibre surrounding the phloem in the stem) in flax fibre production (FCC, 2014). Flax residues are a mixture of discarded plant parts including shives, leaves, corticles, bolls, immature seeds, etc. (Morrison, 1957). Fresh flax forage: flax crops delayed by weather and damaged by frost can result in incomplete seed development, and in some cases, regrowth, including flowering, may have occurred on the green plant. However, while fresh flax forage is nutritious, it may contain toxic amounts of hydrogen cyanide (HCN) and nitrates, and farmers should exercise caution before feeding it to livestock (see Potential constraints on the "Nutritional aspects" tab) (Government of Saskatchewan, 2008b). Flax straw is often burned on the ground, or, increasingly, collected and turned into useful materials such as animal bedding, non-structural building materials (insulation, wind-break, anti-erosion), specialty papers, replacers for fibreglass or cotton fibre, etc. (FCC, 2014). Flax straw bales or pellets are used as heating fuel for greenhouses, barns or agricultural drying installations. Finely chopped flax straw can be spread or ploughed under using specialized equipment (SFDC, 2008). Flax residues of fibre production are of very poor feed quality and mostly valuable as garden mulch, and livestock and horse bedding (Morrison, 1957; Coop de France, 2014). Flax straw and other flax crop residues have been mentioned as potential feeds since the 19th century, but their use for feeding purposes has reduced in recent years. Flax is thought to have originated from India and to have spread westwards along trade routes. It was brought to North America and Australia by colonization (Muir et al., 2003). Flax is possibly one of the first domesticated crops. It was grown and used for fibre, as early as 10,000 BCE in the Fertile Crescent, as well as for food and for its medicinal properties. Linseed oil was first used as an oil paint preservative by the Flemish painter Jan van Eyck around 1400 CE. The linoleum process, which uses linseed oil to create durable floor covering, was patented in 1860 in England. Today flax is valued both for its industrial uses (oil and fibre) and for the potential health benefits of the seeds (Przybylski, 2005; Muir et al., 2003). Flax is mainly grown in temperate areas. In 2012, there were 2.7 million ha worldwide used to produce linseeds, and estimated production reached 2 million t. The main linseed producers, Canada, Russia, China, Kazakhstan and the USA, account for more than 70% of the total production (FAO, 2013). Flax is a warm season crop and can be sown once the soil becomes warmer. No till or shallow tillage is preferred as these methods provide firm seedbeds, bring few weeds to the surface and do not disturb the organic matter content of the soil. The linseed crop does better on heavy loam soils with a good moisture content than on dry sandy soils. It responds well to fertilizer and can withstand some salinity. Linseed is a poor weed competitor. The linseed crop may be grown in rotation with cereals but not following potatoes, sugar beets (due to problems with root diseases) or following a previous linseed crop (CFIA, 2012). Early stages of growth (prior to bolling) may be very nutritious, while later stages may become too fibrous to be of practical use (Government of Saskatchewan, 2008b). The flax crop generates large amounts of flax straw and the disposal of this by-product is a major environmental issue in flax-growing regions. Flax straw is poorly degraded and difficult to plough under, since the fibres wrap themselves around and/or plug disks, wheels and shovels. 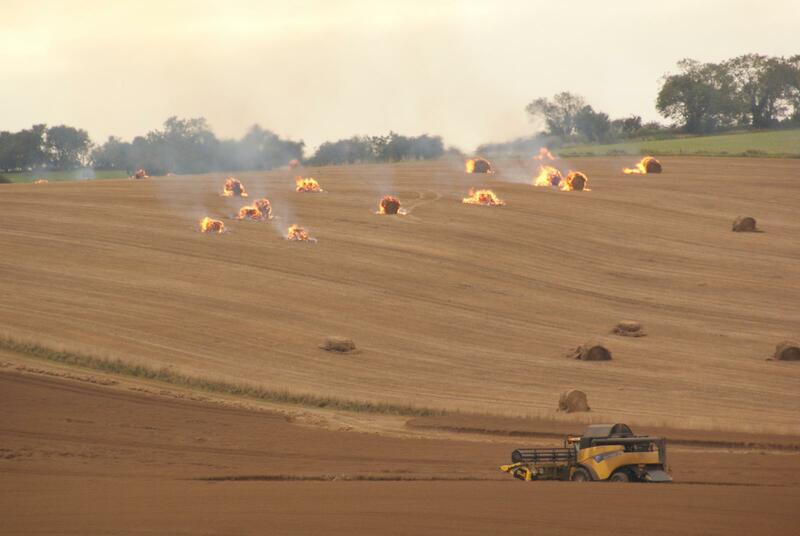 For that reason, flax straw is often burnt on the ground, which causes air pollution and health concerns (FCC, 2014; CLA, 2014). However, there are now many other uses for flax straw, such as turning it into an alternative fibre source, or as a biofuel feedstock, which may alleviate the environmental problems caused by this residue (Comeau, 2006; FCC, 2014). Little information exists about the composition of fresh flax forage. An Italian study reported that its protein content was relatively high (18% DM) at stem extension and fell sharply after budding to 12% DM when the seeds were mature. Fibre content was quite high (ADF from 37 to 55% DM), and in particular lignin content (from 11 to 15% DM) (Peiretti et al., 2008). The potential toxic content (HCN and nitrates) of flax forage is a cause for concern (see Potential constraints below) (Government of Saskatchewan, 2008b). Flax straw and flax crop residues have a poor protein content (usually less than 8% DM) and a very high fibre content, notably lignin (more than 10% DM for flax straw). Their feed value is limited. They are usually of lower value than cereal straws. The leaves, stems and seeds of fresh flax forage may contain toxic amounts of hydrogen cyanide (HCN). As chewing and rumen bacteria activities increase cyanide production, cyanide poisoning is more likely to happen in ruminants (EFSA, 2007). In livestock, a HCN content of more than 750 mg/kg DM is considered hazardous, 500-750 mg/kg DM is doubtful, and less than 500 mg/kg DM is considered safe (Kahn, 2005). In particular, regrowth after harvest or after frost can be unsafe as new leaves and stems contain higher levels of HCN than mature leaves, making mature flax forage safer than younger flax, even though its nutritive value is lower. The danger is greater if the immature flax is frozen. It may be possible to mitigate the risk through generous applications of fertilizer: in sorghum, also a HCN accumulator, moderate N fertilizer and good P and K levels can help to limit the concentration of HCN in forage (Government of Saskatchewan, 2008b). If livestock is allowed to graze the flax swath, care should be taken that no hungry animal enters the field if the flax has been recently cut. Feeding hay or grain will reduce the HCN concentration in the digestive tract. Standing flax straw should not be grazed as the act of trampling and chewing releases the cyanogenic glycoside and the ß-gycosidase enzymes (Government of Saskatchewan, 2008b). After harvest, hay making and ensiling can reduce HCN content by more than 50% as it is released as cyanide gas. Storage also helps to reduce the HCN content (Government of Saskatchewan, 2008b). The flax plant tends to accumulate nitrates after frost. If the plant is alive and allowed to regrow for a week, it can metabolize the nitrates, thus reducing the risk of nitrate poisoning. If the plant has been killed by the frost, the crop should be harvested as soon as possible and then tested for nitrates. If the nitrate content is higher than the safe level, the flax forage should be mixed with other feeds to reduce the level of nitrates in the diet (Government of Saskatchewan, 2008b). In Canada, official recommendations regard flax straw as a cause of rumen impaction and suggest providing adequate protein and energy to prevent this undesirable effect (Government of Saskatchewan, 2008a). However, some reports consider that the fibres are digested like other fibrous materials and do not form indigestible balls in the stomach (Duke, 1983). The in vitro OM digestibility of fresh flax forage was found to be quite high (76%) at stem extension and then to decrease linearly as the plant aged, down to 54% when the seeds matured. The optimal harvesting stage was considered to be at the brown capsule stage (in vitro OM digestibility 65%) as the n-6/n-3 fatty acids ratio was still low (Peiretti et al., 2008). However, flax forage is prone to HCN production and care must be taken to limit access for grazing (see Potential constraints above). Flax straw is a poor quality roughage but it can be a useful livestock feed in times of scarcity (drought, feed shortages, etc.). Flax straw is readily eaten by cows (Government of Saskatchewan, 2008b) but an early report found that it was unpalatable to sheep (Whiting, 1958). The in vivo OM digestibility of flax straw is generally low (34-49%) (Mann et al., 1988; Howard et al., 1991; Neumark, 1970; Kolari et al., 1961; Whiting, 1958). In Canada, flax straw was found to have a much lower digestibility than wheat straw, wheat chaff (Mann et al., 1988), and oat straw (Whiting, 1958). In Egypt, a comparison of flax straw with other roughages (rice straw, sugarcane bagasse, date stones, berseem hay) found that flax straw contained the most fibre and had the lowest rumen gas production and estimated ME (3.93 MJ/Kg DM), as well as a very low in vitro OM digestibility (27%) (Sallam et al., 2007). Treatment with anhydrous ammonia (3.5% DM basis) can improve the nutritive value of flax straw, as shown by two experiments carried out in Canada. Ammoniation increased the nitrogen content of the straw by 2 or 3 times, with increases also in feed intake and digestibility (Howard et al., 1991; Mann et al., 1988). In sheep, ammoniation significantly increased OM intake, so that ammoniated flax only required 25% supplementation with sweet clover (Melilotus officinalis) compared to 75% supplementation with untreated flax straw (Howard et al., 1991). In a comparison of flax straw, wheat straw and wheat chaff offered to steers, ammoniation increased in vitro OM digestibility (from 35 to 46%), in vivo OM digestibility (from 34 to 58%), ADF (from 10 to 40%) and NDF (from -0.6 to 38%) of the flax straw, while ammoniation failed to increase the in vivo digestibility of the other crop residues. Ammoniation did not change the lignin content of any of the crop residues. Winter feeding of young beef cows with ammoniated flax straw resulted in average daily gains almost as high as those obtained with hay, and significantly higher than with the other crop residues. Backfat thickness was higher with hay or ammoniated flax straw. It was concluded that for young wintering beef cows, ammoniated flax straw (3.2 kg/day) given with barley (5.6 kg/day) had a feeding value similar to that of medium quality bromegrass/alfalfa hay (Mann et al., 1988). No reports regarding the use of flax straw in rabbit feeding were available at the time of writing (April 2014). Flax chaff is considered as a usual and safe source of fibre for rabbit feeding in some countries, including Belgium. It is generally used at 5 to 8% in experimental control diets in growing rabbits studies (Maertens et al., 1994; Peeters et al., 1995; Guermah et al., 2012) and at up to 14% and 21% in some experimental diets (Maertens et al., 1997; Vossen et al., 2012). Including 5-6% of flax chaff in the diets of rabbit does did not cause any problem such as breeding difficulties (Maertens, 1998). In a digestibility study where flax chaff and other fibrous materials were included at 40% in the diet of growing rabbits, the digestibility of DM and energy of flax chaff were low (24-23%) as well as that of crude protein to a lesser extent (48%). The digestible energy of the flax chaff was estimated at 4.36 MJ/kg DM (Maertens et al., 1984).